Successfully Added Deluxe Handheld Battery Tester to your Shopping Cart. This handheld battery tester comes with an easy-to-read LCD display and adjustable sliding arm for varying battery sizes. A convenient chart on the back of the battery tester helps you determine if your batteries are in good condition or if they need to be recharged/replaced. 1) Heading out at night? Don't be left in the dark, check how much power is left in your flashlight's battery. 2) Taking a 10 hour flight? Make sure your favorite handheld Going on a road trip and need to listen to your favorite radio station or news broadcast? Make sure the batteries in your pocket radio are going to last. 3) Bought one of our RC toys and about to head to the park with your kid? First make sure the batteries will last long enough! 4) Are the batteries in your smoke detector working? Are you sure? Fire safety is serious, don't leave any doubts and use this tool to check the batteries now. 5) Have a meeting in the morning? Don't regret it when your alarm clock's battery dries up, check and double-check with this battery tester. 6) Recording a huge event? Make sure your video/camcorder's battery is up to the job and has the power to handle it. 7) Want to use your cool, new laser pointer to give a big presentation? Don't embarrass yourself when the batteries don't die on you, check the night before with this handy battery tester. Like a ruler and scissor, this is a tool you might not use everyday but you'll be extra glad you have one laying around when you need it. And since the battery tester is powered by the battery being checked, there is no need for anything else, this is an all-in-one tool! Don't delay and order today, this hot new item comes with a minimum order quantity of 10 units and is available at an unbeatable price from Chinavasion - your best source for high quality, low priced gadgets. Suitable for 1.5V (AA, AAA, C or D type), 9V (PP3 type) and 1.5V button cells. If the digits did not show, check that battery is touching both contacts, otherwise the battery is completely dead. 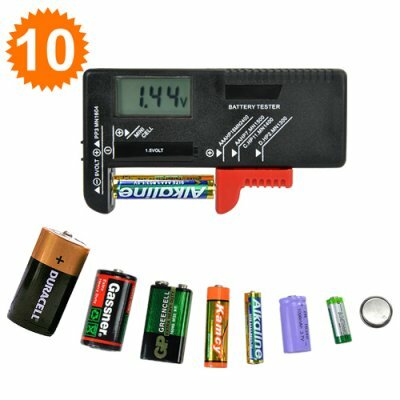 Can I take this battery tester with me wherever I go? Definitely, the small handheld size and light weight makes it a perfect tool to keep in your bag and take it with you wherever you go. It's as simple as 123. The battery tester has text on the unit to indicate which battery goes where. on 2010-03-10 22:36:21 Good Product!! !